April read: I AM NOT OLD ENOUGH! – Independence Through Connections. April read: I AM NOT OLD ENOUGH! You can tell from that photo that this is a fun one! I recently finished reading a delightfully funny book by a Madison author, Hilde Adler, who lived in Shorewood Hills for 45 years and is now residing in Oakwood University Woods. Hilde recounts with a great of angst and wisdom the push and pull of making the very hard decision of moving to a retirement community and the self-talk that goes into making that decision. The book is called: I AM NOT OLD ENOUGH! The 27 Stages of Adjustment to Living in a Retirement Community. It is a 52-page paperback, and its wit and humor make it a pleasure to read in one sitting. Some of the very short chapters are: “I am not moving anywhere. I love my house. I can handle it. I am not going to live in an apartment”, “I don’t want to live with all those old people”, “So maybe I’m as old as some of those people but I look younger”, and 24 mini-chapters in a similar vein. The book brought me deep guffaws, recognition of buried (and some not so buried) feelings of leaving my home and moving on to a different way of living and being. I loved this book. It’s available on Amazon as of April 19. Read a glowing review and learn more about the author here. Thanks, Joy, for the recommendation! 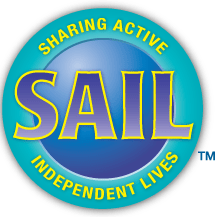 If you have book recommendations or anything else you’d like to add to the blog, contact info@sailtoday.org!